Whether you own a small, family owned and operated business, or a controlling interest in a multi-million dollar venture, many of the legal issues you will face are the same. Often, the manner in which you handle and resolve those legal issues will have a direct and profound influence on the success, or failure, of your business. Contracts, in particular, are likely to be an important aspect of your business as almost every business enters into contracts with customers, suppliers, and other businesses. Having an experienced Business and Contracts attorney to rely on for advice and guidance is imperative. Is the name you have chosen available? Do you need to apply for any patents, copyrights, or trademarks? What type of business entity is best for your business? What local, state, or federal permits are required? Is the property zoned properly? What state and federal tax forms need to be completed? Do you need to purchase liability insurance? Workers’ compensation? Once the business is up and running, you will continue to encounter legal issues on a regular basis. If those issues are not resolve in a timely manner, they can turn into legal disputes. The cost of litigating a legal dispute is always much more than the cost of resolving the issue before it escalates. Partnership agreement with your business partner(s) establishing the terms of your co-ownership of the business. Contract for sale or lease of the property where you plan to open your business. Website design and maintenance – in today’s electronic age, a business without an internet presence is all but invisible. Every contract you enter into should be negotiated on your behalf by an experienced Contracts Attorney to ensure that your interests are protected. Moreover, the longer you stay in business, the greater the likelihood that you will end up in a contractual dispute over one of those contracts. At that point, having an experienced Contracts Attorney on your side to defend your interests will be essential. From concept to dissolution, contracts will be part of owning and operating a business. A poorly written contract increases the likelihood of a dispute as does the lack of a contract when one should have been executed. The key to avoiding most disputes, and prevailing when a contractual dispute cannot be avoided, is having an experienced Contracts Attorney on your side. 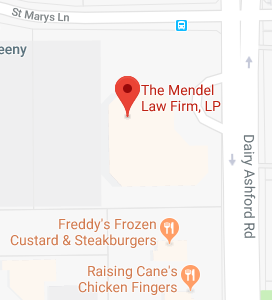 Whether you are contemplating the start of a business, or are already a business owner, the Business and Contracts attorneys at The Mendel Law Firm, L.P. are dedicated to helping make your business a success. Contact the team today by calling 281-759-3213 or fill out our online contact form.